White Mountain Textiles Dust Mite covers for your mattress, box spring, and pillows. 100% natural cotton dust mite covers with a soft 260 thread count. Certified dust mite allergen barrier covers with 4.39 micron average pore size. Expert advice, reviews and comparisons. Our White Mountain Textiles Cotton Deluxe dust mite mattress covers offer exceptional protection at a great value. These mattress covers are made of 100% cotton that is naturally soft and breathable creating a comfortable sleeping environment. The 260 thread count fabric features a tight weave and is a certified allergen barrier with an average pore size of 4.39 microns. The White Mountain Textiles Cotton Deluxe dust mite covers are available as mattress, box spring, pillow, comforter and duvet covers. 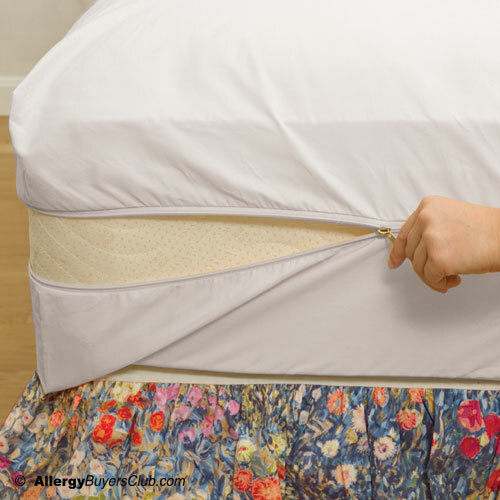 Encasing your mattress, pillows and comforter is an important step in allergy prevention and will help you wake feeling healthy and refreshed. These dust mite covers have a strong polyester zipper for a secure closure that is durable yet discrete under your bed linens. We offer a full range of sizes as well as extended sizes to meet all your dust mite cover needs. Do not go another day waking up to itchy eyes and a runny nose. View our entire collection of White Mountain Textile Dust Mite Covers. Machine wash and dry up to 140 degrees. Can also be hung dry. Imported cotton. Made in China. Soft and lightweight to the feel but with a durable construction. The 100% cotton fabric is smooth and breathable under bed linens. Tested by PMI to be a certified allergen barrier with a mean pore size of 4.39 microns. Fabrics with pore sizes below 6 microns are the best for blocking dust mites and their allergens. Cotton is naturally breathable and a good choice for someone who is a hot sleeper and can not have the heat build up found with synthetic fabrics. Durable construction and quality manufacturing make these dust mite covers safe to machine wash and dry (though we do not recommend washing more then 3 or 4 times a year to maintain the fabrics barrier efficiency). Our White Mountain Textiles Cotton dust mite mattress covers are some of the nicest we have felt and are very reasonably priced. The cotton fabric is soft and lightweight and offers a very small pore size 4.39 micron which is excellent for a woven dust mite cover. A dust mite cover with a small pore size like this is a very efficient barrier to dust mites and their allergens (i.e. broken body parts and feces). One of my favorite things about these mattress covers is they are discrete and quiet, so your family and guests will never know you have dust mite covers on unless they peak under the sheets. A cotton dust mite cover is also very breathable and will not retain excess heat while sleeping. They are easy to wash with durable construction; however, we do not recommend washing more than absolutely necessary due to the fact that woven fabrics loosen with wear and tear which will increase the pore size and reduce their effectiveness. Also, though many times less likely than synthetic covers to cause irritation, these are not organic and could possible cause irritation to those who have multiple chemical sensitivities or super sensitive skin. If you are concerned about possible irritation, it is probably in your favor to spend a little more and purchase our Solus Organic Cotton Dust Mite Covers. Mattress Cover: sold individually and available in a full range of sizes: Crib, Twin, Twin XL, Full, Queen, Eastern King, California King, with 2 depths to choose from 9" or 15" allowing the perfect fit. Mattress covers zip at one end and zipper extends down 1/4th of each adjacent side. Includes 2 pillow covers. 100% cotton, 260 thread count, certified allergen barrier with average pore size of 4.91 microns. Cotton is soft, breathable, and lightweight. White. Zipper closure. Sizes: Standard 21"W x 27quot;L, Queen 21quot;W x 31quot;W, or King 21quot;W x 37quot;L.